PTMSC Blog : Tomorrow is the BIG Day! 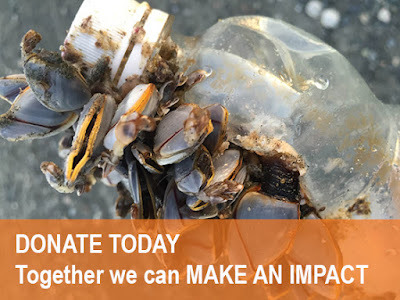 Tomorrow, Tuesday, May 3, the Port Townsend Marine Science Center is trying to raise $15,000 through GiveBIG, the Seattle Foundation's one-day online charitable giving event. Help us address the problems affecting our oceans today — together we can make an impact! Your donation will help us raise $15,000 tomorrow — thanks to a group of generous PTMSC supporters, the first $7,500 donated will be matched dollar for dollar and stretched even further by the Seattle Foundation! Schedule your gift right now! Your support allows us to train volunteers and inspire visitors to make a collective impact with our Gone Green? Go Blue! exhibits, continue to monitor the health of local sea star populations in the wake of sea star wasting, and teach students and visitors how to "be a toxic-free zone" to keep plastics and harmful chemicals out of our oceans. Gooseneck barnacles attached to plastic water bottle. Learn from Whales, read about a once-in-a-lifetime Orca encounter, and take a quiz to learn what kind of Change Maker you are. Thank you for being a champion of ocean health and conservation. The GiveBIG campaign only lasts for one day, so please help us in raising $15,000 on Tuesday, May 3. Schedule your gift today to help us reach our goal and share this post to spread the word! Water, Water Everywhere: It's A WaterWorld! Four Reasons to be Thankful!